Viewed against the backdrop of a summers day with the rays of the sun streaming through, this lovely tree is absolutely delightful! With a moderate rate of growth and deep roots this is the perfect tree for a small garden and doesn't mind nearby pavements or patios. The feathery foliage is a luminous yellow as it emerges in spring and deepens over summer to a glowing lime green. Sunburst lacks the sharp thorns of other Gleditsias making it a great choice if you have children or pets. Delivered as a 90cmtall tree in 3L pot for immediate planting - deciduous, so no leaves on Nov - April. Viewed against the backdrop of a summers day with the rays of the sun streaming through, this lovely tree is absolutely delightful! With a moderate rate of growth and deep roots this is the perfect tree for a small garden and doesn't mind nearby pavements or patios. 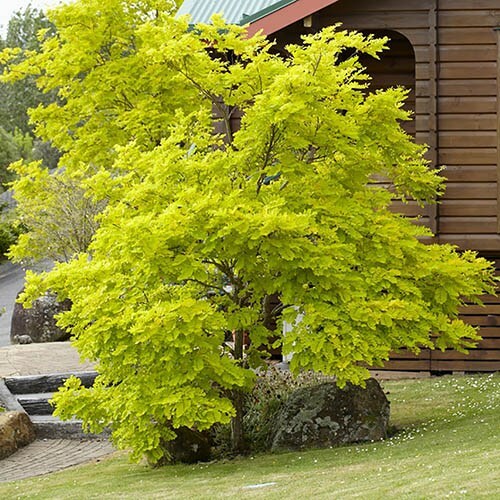 The feathery foliage is a luminous yellow as it emerges in spring and deepens over summer to a glowing lime green. Sunburst lacks the sharp thorns of other Gleditsias making it a great choice if you have children or pets. A splendid and unusual new tree that deserves a place in any garden. Delivered as a 90cm tall tree in 3L pot for immediate planting. Deciduous, so no leaves on Nov - April.